Heat oven to 375 degrees F . Slice about ½ inch off of the pointy side of the garlic bulb. Put bulb in the center of a piece of foil making a bowl with the foil around the garlic. Drizzle on some olive oil and a dash of sea salt. Rap the bulb in foil. Cut cherry tomatoes in half, squeezing out some of the juice from the core, and place in a medium bowl. Drizzle with olive oil, sea salt, and pepper, then mix to coat. Spread tomatoes onto a cookie sheet and roast, along with the garlic bulb, for 30 minutes. Set both aside once finished cooking. 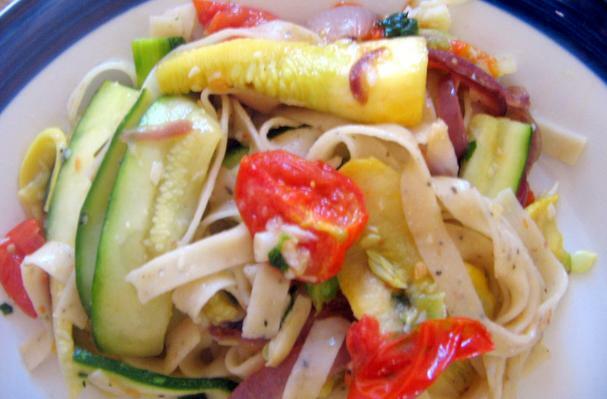 Slice zucchini thinly lengthwise using a knife or peeler to make ribbon like pieces. Place in a bowl and add the juice of one lemon, about 2 tbsp of olive oil, green onion, cilantro salt, and pepper. Mix to coat and set aside. Bring water to a boil in a medium pot. While that is coming to a boil, unwrap the garlic bulb from the foil and squeeze out each clove into a small bowl. They should be soft enough to slip right out. Smash the roasted cloves until it looks almost like a paste. Then add the juice of the remaining lemon, and 2-3 tbsps of olive oil. Set aside. In a large pan sauté the zucchini mixture on medium heat. Cook for about 3 minutes stirring often. Add roasted tomatoes and sautéed red onions, and cook for another minute. Add the cooked pasta and toss. Finally add the roasted garlic sauce and toss to coat. Enjoy!